Hassan et al. “Influence of micronutrient (boron) for the growth and yield of cauliflower”. Journal of Bioscience and Agriculture Research, 18(01) (2018)1464-1469. The experiment was conducted for varietal screening of mungbean against sucking insect pest whitefly (Bemisia tabaci) and aphid (Aphis gossypii). Different mungbean varieties i.e. BARI Mung-1, BARI Mung-2, BARI Mung-3, BARI Mung-4, BARI Mung-5 and BARI Mung-6 were used as treatment for this study. The experiment was laid out in Randomized Complete Block Design (RCBD) with three replications. Data on different parameter were recorded and statistically significant variation was observed for different varieties. Among the varieties, BARI Mung-6 showed the least whitefly and aphid population and highest resistance against whitefly and aphid infestations at different stages than all other varieties. The highest seed yield (1.82 t ha-1) was recorded from BARI Mung-6, while the lowest (1.30 t ha-1) was recorded from BARI Mung-4. It means that BARI Mung-6 were superior to other varieties in terms of lowest whitefly and aphid infestation and maximum yield. Key Words: Mungbean, Infestation, Resistance, Whitefly, Aphid. Abdullah-Al-Rahad, et al. "Varietal Screening of Mungbean against Whitefly and Aphid." Journal of Bioscience and Agriculture Research 18 (1) (2018): 1478-1487. Abdullah-Al-Rahad, M., Rahman, M. S., Akter, T., Akter, J., Rahman, M. A., & Aziz, S. M. S. (2018). Varietal Screening of Mungbean against Whitefly and Aphid. Journal of Bioscience and Agriculture Research, 18(1), 1478-1487. Abdullah-Al-Rahad, Mohammad, Md Saidur Rahman, Tahmina Akter, Jasmin Akter, M A Rahman, and Sheik Md Showkat Aziz. "Varietal Screening of Mungbean against Whitefly and Aphid." Journal of Bioscience and Agriculture Research, 18 (1) (2018): 1478-1487. Abdullah-Al-Rahad, M., Rahman, M. S., Akter, T., Akter, J., Rahman, M. A. and Aziz, S. M. S. 2018. Varietal Screening of Mungbean against Whitefly and Aphid. Journal of Bioscience and Agriculture Research, 18 (01), pp. 1478-1487. Abdullah-Al-Rahad M, Rahman MS, Akter T, Akter J, Rahman MA, Aziz SMS. Varietal Screening of Mungbean against Whitefly and Aphid. Journal of Bioscience and Agriculture Research. 2018 December 18(1): 1478-1487. Hossain, F. M. M., M. H. Mian, M. R. Islam, and C. K. Mahapatra. 2018. "Effects of Bradyrhizobium on growth nodulation and nitrogen uptake by akashmoni." 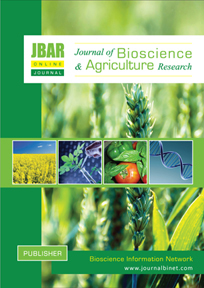 Journal of Bioscience and Agriculture Research no. 18 (1) (2018):1488-1495. Hossain FMM, Mian MH, Islam MR, Mahapatra CK. Effects of Bradyrhizobium on growth nodulation and nitrogen uptake by akashmoni. Journal of Bioscience and Agriculture Research. 2018; 18(1):1488-95. Salinity is considered as one of major threats in rice production around the world. This experiment was conducted to screen out the salt tolerant rice genotypes following modified hydroponic method and IRRI standard protocol (SES scoring). Twenty-five rice genotypes were evaluated for the screening purpose for salinity tolerance considering morphological parameters. Three levels of salinity treatments (EC-0 dSm-1, EC-7 dSm-1 and EC- 12 dSm-1) were used for the phenotypic analysis and genotypes were categorized according to SES scoring based on visual salt injury in rice seedlings at 21th days of saline treatment. Salt injury symptoms varied among the landraces with different concentration of salt. All plant parameters reduced significantly in all genotypes with increasing salinity although less reduction was found in some genotypes at higher salinity also and identified those genotypes as salt tolerant. After 21 days of salinization, five genotypes (Maloti, Chinisagor, Lal bat, Moyna, Binadhan-8 and Binadhan-10) were found as slat tolerant at both 7 dSm-1 and 12 dSm-1 according to standard evaluation score based on visual salt injury at seedling stage. The phenotypic co-efficient of variation (PCV) was higher than genotypic co-efficient of variation (GCV) for all the traits studied indicating that they all are interacted with the environment to some extent. The highest heritability was found for all traits in the range of 73.82% to 96.08% indicating that the traits are less influenced by environment and these traits can be considered for the improvement of salinity tolerance. High heritability coupled with high genetic advance as percent of mean was observed for standard evaluation score (96.08%, 130.51%), root dry weight (95.72%, 135.08%) and shoot fresh weight (94.63%, 68.38%) indicating the role of additive gene expression for these traits and would facilitate better scope for improvement of these traits through direct selection. The correlation and path analysis showed that live leaves (%), survival rate (%), shoot length, chlorophyll content, root fresh weight, root dry weight had significant negative correlation with standard evaluation score as well as had direct positive effect on standard evaluation score indicating their importance for the improvement of salt tolerance ability of plant. Eti, et al. "Morphological Based Screening and Genetic Diversity Analysis of the Local Rice (Oryza Sativa L.) Landraces at the Seedling Stage for Salinity Tolerance." Journal of Bioscience and Agriculture Research 18 (1) (2018): 1496-11. Eti, I., Rasel, M., Hassan, L., & Ferdausi, A. (2018). Morphological based screening and genetic diversity analysis of the local rice (Oryza sativa L.) landraces at the seedling stage for salinity tolerance. Journal of Bioscience and Agriculture Research, 18(1), 1496-1511. Eti Iffat, Md. Rasel, Lutful Hassan and Aleya Ferdausi. 2018. "Morphological based screening and genetic diversity analysis of the local rice (Oryza sativa L.) landraces at the seedling stage for salinity tolerance." Journal of Bioscience and Agriculture Research 18 (1) (2018): 1496-1511. Eti, I., Rasel, M., Hassan, L. and Ferdausi, A. 2018. Morphological based screening and genetic diversity analysis of the local rice (Oryza sativa L.) landraces at the seedling stage for salinity tolerance. Journal of Bioscience and Agriculture Research, 18 (01), pp. 1496-1511. Eti I, Rasel M, Hassan L, Ferdausi A. Morphological based screening and genetic diversity analysis of the local rice (Oryza sativa L.) landraces at the seedling stage for salinity tolerance. Journal of Bioscience and Agriculture Research. 2018;18(1):1496-11. Yield contributing traits in thirty three rice genotypes were studied for variances, heritability, correlation (genotypic and phenotypic) and path coefficient analysis. The highest phenotypic variation (σ2p), was found for No. of grain per panicle and the lowest was observed in 100 grain wt. High genotypic coefficient of variation (GCV) and phenotypic coefficient of variation (PCV) for No. of unfilled grains per panicle, No. of grains per panicle and grains yield per hill, indicated that selection of these traits would be effective. The high heritability estimates along with low genetic advance indicates that non-additive type of gene action and genotype-environment interaction plays a significant role in the expression of the traits as observed in days to 50% flowering, No. of tillers per hill days to harvesting and panicle length (cm). No. of grains per panicle with grains yield per hill as well as length showed significant and positive correlation but No. of tillers per hill showed highly significant and negative correlation with days to 50% flowering both at genotypic and phenotypic level. Path coefficient analysis showed that No. of grains per panicle had maximum direct effect on grain yield followed by No. of panicles per hill, and No. of tillers per hill. The lowest direct effect on grain yield was exhibited by No. of unfilled grains (0.0732) followed by plant height, No. of primary branches per panicles, and No. of secondary branches per panicles respectively. Number of grains per panicle had maximum direct effect on grain yield followed by No. of panicles per hill and No. of tillers per hill. The results prescribed that there is a highly significant positive correlation with positive direct effect was observed in No. of grains per panicle, No. of panicles per hill, No. of unfilled grains per panicle, No. of primary branches and No. of secondary branches. Hossain, S. et al. "Variability, Correlation and Path Analysis in Drought Tolerant Rice (Oryza Sativa L.)." Journal of Bioscience and Agriculture Research 18(2) (2018): 1521-1530. Hossain, S., Salim, M., Azam, M. G., & Noman, S. (2018). Variability, correlation and path analysis in drought tolerant rice (Oryza sativa L.). Journal of Bioscience and Agriculture Research, 18(2), 1521-1530. Hossain, Shahadat, Md. Salim, Md. Golam Azam, and Shibly Noman. "Variability, correlation and path analysis in drought tolerant rice (Oryza sativa L.)." Journal of Bioscience and Agriculture Research no. 18(2) (2018): 1521-1530. Hossain, S, Salim, M, Azam, MG and Noman, S 2018. Variability, correlation and path analysis in drought tolerant rice (Oryza sativa L.). Journal of Bioscience and Agriculture Research, 18(2), pp. 1521-1530. Hossain S, Salim M, Azam MG and Noman S. Variability, correlation and path analysis in drought tolerant rice (Oryza sativa L.). Journal of Bioscience and Agriculture Research. 2018 December 18(2): 1521-1530. ​Authors: Shrestha, K. P., Giri, R., Mishra, S. and Shrestha, J.
Bio-slurry, a byproduct of biogas plant is not using properly and most of the cases causing environmental and social hazard by discharging it in public places though it rich in nutrients especially protein (16-20% CP) and produced through beneficiary anaerobic microorganisms. On the other hand, Straw is highly fibrous residue having low protein (CP <3%) content which mostly indigestible. The poor digestibility of straw is further caused by the presence of high amount of inhibitory mineral element called silica. The combination of low intake, low degradability, low nitrogen content and an imbalanced mineral composition means that rice straw alone may not even meet the animal’s maintenance needs. Therefore, the animals are suffering from nutrients deficiencies resulting in poor health and productivity of these animals reared on straw based ration. Under this situation, it is essential to find out the ways and means to increase the supply and quality of feed to livestock to fulfill their deficiencies. So, the way to improve the crude protein, metabolizable energy and preservation quality, wet rice straw can be ensiled with biogas slurry. The principles of ensiling process of straw are maintenance of anaerobic conditions throughout the ensiling and rapid decline in pH value by lactic acid bacteria. Ensiling of wet rice straw along with biogas slurry may produce a good quality ensilage for feeding cattle having desire palatability, nutrient content and digestibility and also reduce the environmental pollution. Key Words: Biogas slurry, Wet rice straw, Protein content, Metabolizable energy, Feed preservation technique and Future prospects. Sarker, et al. “Wet rice straw ensiling with biogas slurry: A prospective feed preservation technique for higher protein content and metabolizable energy”. Journal of Bioscience and Agriculture Research, 18(02) (2018) 1539-1548. Sarker, L. R., Khan, M. R. I. and Das, S. K. (2018). Wet rice straw ensiling with biogas slurry: A prospective feed preservation technique for higher protein content and metabolizable energy. Journal of Bioscience and Agriculture Research, 18(02), 1539-1548. Sarker, L. R., Khan, M. R. I. and Das, S. K. “Wet rice straw ensiling with biogas slurry: A prospective feed preservation technique for higher protein content and metabolizable energy”. Journal of Bioscience and Agriculture Research, 18(02) (2018): 1539-1548. Sarker, L. R., Khan, M. R. I. and Das, S. K. 2018. Wet rice straw ensiling with biogas slurry: A prospective feed preservation technique for higher protein content and metabolizable energy. Journal of Bioscience and Agriculture Research, 18(02), pp. 1539-1548. Sarker, LR, Khan, MRI and Das, SK. Wet rice straw ensiling with biogas slurry: A prospective feed preservation technique for higher protein content and metabolizable energy. Journal of Bioscience and Agriculture Research, 2018 December 18(02): 1539-1548. ​Authors: Prasai, H. K. Sah, S. K. Gautam, A. K. and Regmi, A. P.
Intensive conventional tillage practices in Doti district, far western Nepal has been experiencing low crop productivity and profitability. A shift towards conservation agriculture (CA) practices improve the crop production and farmer’s net income. This research assessed the effects over two consecutive years (2014/15– 2015/16) of CA system on crop and system productivity and profitability of different maize-based cropping system. This study under split-split plot design with four replications examined the effects of two cropping systems (Maize-wheat-mungbean and maize-lentil-mungbean), two cultural practices (CA and conventional agricultural practices) and four varietal sequences (Rajkumar-Dhaulagiri and Shimal-Pratikshya, Rajkumar-WK 1204 and Khajura1-Pratikshya, Arun2-Dhaulagiri and Shimal-Kalyan and Arun 2-WK 1204 and Khajura1-Kalyan). Results showed that cereal-cereal-legume cropping system, CA practices and varietal sequence of Rajkumar-WK 1204-Pratikshya produced 10.87% higher system yield (12.85 t ha-1yr-1) than conventional agricultural practices (11.59 t ha-1yr-1), 83.47% higher system net benefit (1554 US$ ha-1yr-1) than conventional agricultural practices (847 US$ ha-1yr-1) and 7.76% higher maize equivalent yield (17.08 t ha-1yr-1) than conventional agricultural practices (15.85 t ha-1yr-1). Similarly, cereal-legume-legume cropping system, CA practices and varietal sequence of Rajkumar-Khajura1-Pratikshya produced 19.62% higher system yield (9.39 t ha-1yr-1) than conventional agricultural practices (7.85 t ha-1yr-1), 139.39% higher system net benefit (1594 US$ ha-1yr-1) than conventional agricultural practices (666 US$ ha-1yr-1) and 12.70% higher maize equivalent yield (16.50 t ha-1yr-1) than conventional agricultural practices (14.64 t ha-1yr-1). Therefore, farmers should apply cereal-cereal-legume cropping system (irrigated condition), cereal-legume-legume cropping system (rainfed condition), CA practices and varietal sequence of Rajkumar-WK 1204-Pratikshya and Rajkumar-Khajura1-Pratikshya for higher system productivity and profitability.